Dustin Poirier ended his rivalry with Eddie Alvarez in the UFC's return to Calgary, stopping the former lightweight champion in the second round of their main event on Fox. Plus, former champions Jose Aldo and Joanna Jedrzejczyk snapped their respective losing streaks with big wins on Saturday. When the UFC last stepped foot onto Calgary, Alberta, the lasting impression was a forgettable card that UFC president Dana White would always remind the city that the UFC “owed them one” for the July 2012 debacle. While history remembers UFC 149 as a disaster, it was two awful fights on a pay-per-view main card that stunk out the Scotiabank Saddledome and while there have been much better cards in the promotion’s history, there have also been worse. Saturday’s return for the UFC’s penultimate Fox network special served up a tremendous main card, highlighted by a rematch between Dustin Poirier and Eddie Alvarez. The two lightweights left Dallas, Texas in May 2017 with a no contest attached to the bout, which was waved off after a series of illegal knees delivered by Alvarez. While respect was exchanged in the moments following the fight, bad blood brewed in the aftermath with criticism sent each other’s way. It took over a year to get the two back into the cage, but it was well worth the wait. After a competitive opening round, it appeared Poirier took the round through constant use of his jab to offset the body shots that Alvarez was registering. The second round featured a call made by referee Marc Goddard that will be questioned and the return of the 12-to-6 elbow debate. Midway through the round, Alvarez was able to mount a seated Poirier against the cage and dropped a 12-to-6 elbow onto the shoulder of Poirier. It prompted Goddard to not only warn Alvarez of the illegal elbow but to stand to the two men up and take Alvarez’s dominant position away. Moments later, Poirier crushed Alvarez with a bevy of left hands after the initial stunning blow and lit him up against the fence, dropping and finishing the former lightweight champion. The 12-to-6 elbow rule was added to the unified rules and it has been a hotly debated part of the rules for years. The rule is synonymous for leading to the lone loss on the otherwise flawless record of Jon Jones after the light heavyweight landed an illegal elbow onto Matt Hamill during a December 2009 bout and Jones was disqualified. The elbow is only illegal when coming down in a straight downward position, hence the 12-to-6 analogy, while 11-to-5 or 10-to-4 is deemed legal. That said, it wasn’t the first warning Alvarez received during the fight as this followed a fence grab warning, which Goddard did not necessitate a stand up over. The win solidifies Poirier as one of the top lightweights in the world and certainly the top UFC lightweight to have never fought for the title. 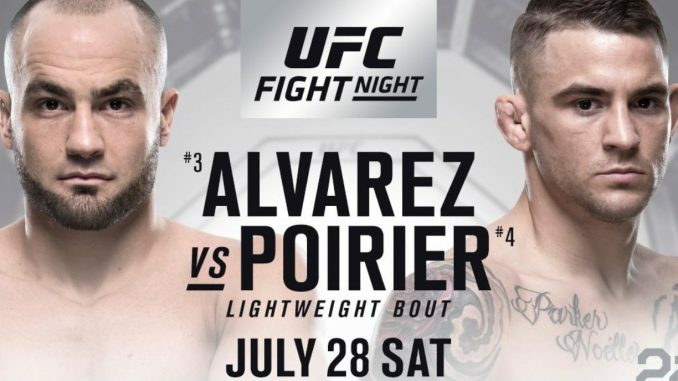 Since returning to the division from his featherweight campaign, Poirier has gone 8-1 with 1 no contest since April 2015, including his current stretch of victories over former champions Anthony Pettis, Justin Gaethje, and Alvarez. Poirier will be forced to play the waiting game as the UFC’s lightweight contenders will be on ice while Khabib Nurmagomedov and Conor McGregor sort out their next fights, with most anticipating the two fighting before the end of 2018. For Poirier, there is great risk in taking a fight to stay busy, although the immediate option would appear to be Tony Ferguson. If the UFC could play their cards correctly, that would be the best fight to book on the same card as Nurmagomedov and McGregor, ensuring a backup option in the event of an injury, while also cementing the next contender if both fights stay together. Saturday’s card also featured featherweight legend Jose Aldo having his arm raised for the first time in two years, stopping Jeremy Stephens in the opening round with a vicious body shot that sent Stephens to the canvas and was left open for Aldo’s strikes. Stephens protested the stoppage by referee Yves Lavigne and was furious with the call. This was Aldo’s first non-title bout since 2009 and first stoppage victory since his title defense against Chan Sung Jung in August 2013. While some felt the final chapter on Aldo’s career was written by Max Holloway, Aldo is still only 31 years old and with the performance put forth Saturday night, there appears to be a lot of life remaining at featherweight. The negative for Aldo is the current champion, who holds two wins over Aldo, and will force Aldo into a series of non-title fights while Holloway sits on top of the division. That said, there are many questions regarding Holloway’s health and the idea of an interim title is not far fetched with Aldo adding his name to the list of candidates to fight Brian Ortega if such a title was installed. Former strawweight champion Joanna Jedrzejczyk was in a similar position as Aldo, having dominated her weight class but running into an opponent that had her number in consecutive outings, that being current champion Rose Namajunas. It took a Canadian detour for Jedrzejczyk to get back on track as she earned a unanimous decision nod over Tecia Torres. The fight was controlled by the pace set forth by Jedrzejczyk, who worked behind an airtight jab that frustrated Torres and kept her at distance. Jedrzejczyk’s lone slip up came during a wild exchange at the end of the second round that allowed Torres to land her most significant shots of the fight. It was Jedrzejczyk’s first win since May of last year, but like Aldo, will have a difficult time navigating her way to the top of her weight class with a champion that holds two victories over her. The main card on Fox kicked off with Alexander Hernandez out wrestling Oliver Aubin-Mercier and taking a workmanlike decision victory after 15 minutes. It was a far cry from the 42 seconds that Hernandez required for his debut victory in the UFC, but he had his arm raised for the eighth consecutive fight and second of his UFC career as he improves to 10-1. The loss was Aubin-Mercier’s first since January 2016 and ended his four-fight winning streak. The UFC returns to pay-per-view next Saturday with UFC 227 from the Staples Center in Los Angeles with two championship rematches headlining the card. On top, bantamweight champion T.J. Dillashaw defends against Cody Garbrandt following their thrilling fight last November at Madison Square Garden where Dillashaw regained his championship. UFC flyweight champion Demetrious Johnson will look to add to his record number of UFC title defenses with his 12th against Henry Cejudo. The two last fought in April 2016 at UFC 197 with Johnson finishing the Olympic Gold Medalist in the opening round of their flyweight title bout.